Fixie Inc's Peacemaker is a bike that was born to turn heads, this much we can say for sure after the guys at Fixie gave us exclusive first go on their new belt drive baby. We had the bike for 10 days, not as long as we usually have to test a bike but long enough even so to get a good impression of what a belt drive bike would be like to live with and to get the measure of its Kickflip hub, the feature of the Peacemaker which sets it apart from the belt drive, er crowd. With its Kickflip the Peacemaker becomes the first belt drive bike you can ride as either fixed or singlespeed. First though what's it like to ride? Smooth, direct… and quiet is the answer. The smoothness of the ride no doubt owes something to the 25mm Vittoria Zaffiro tyres, but mostly it would seem to be down to that belt. Those little teeth are more closely spaced than the links on a chain and the carbon belt itself is much less flexible than a chain. The other thing you notice is the directness of the power transfer. Okay, we know that when it comes to efficiency there really isn't that much in it between a belt and a well maintained chain. On paper the Gates belt is marginally more efficient, although that margin supposedly increases at higher cadences. What we can say from our experience on the bike is that the power delivery was noticeably direct and smooth – of course that is a purely unscientific observation which may well say just as much about the state of the chain on my bike. As you'd expect that directness really comes to the fore when riding fixed. My commute is a fast blast across Bath with a hill at each end and though the gearing is a tad on the high sides for the hills it is really is a blast on the flat especially on a relatively open road. Geometry could be described as road-track, like the Colanago Super Singlespeed we had in last year, and is pretty much the same across all five sizes (S through to XXL) with 74° seat angles in all sizes. Head angles are 73° in the three smaller sizes shading up in to 73.5° and 74° in the two largest. Chainstays are track standard 400mm across the range with wheelbases going from 94.8cm in the smallest size through to 99.9cm in the largest – our medium came in at 96.4 – nice and tight and another factor in the Peacemaker's all-round responsiveness. You can add in those ultra-narrow bars too, the downside as TR was quick to point out is that you really need to get your skids sorted out if you want to thread this through tight spaces. I'm not a big one for skids but as pushing back on the pedals gives as instant and smooth a response as pushing forward I didn't find that a problem. Experienced urban fixed rider, TR, wasn't that impressed with the lack of toe clips on the pedals, more like a set of mini downhill pedals, he reckoned that your shins would pay a price. The inexperienced urban fixie rider – me – had no such problems. I'd go so far as to say it was the most enjoyable street fixed I've ridden to date. Flipping it to the freewheel side though made more sense in a place as hilly as Bath, but that comes at the cost of losing the ghostly silence of the Peacemaker in fixed mode – on the other hand hooning up and down hills is a lot easier and more fun. In either mode handling is direct, those narrow bars, that upright geometry, and of course the belt all see to that. Even so this isn't one of those nervy, jittery bikes that you are constantly fighting, even under pressure the Peacemaker is pleasingly calm. I'd put that down to the combination of the belt and the road buzz absorbing properties of the Peacemaker's lush 4130 frame. Aside from the ride the Peacemaker's other big plus point is the lack of oil so no need to tuck your trouser leg in to your sock, or roll it up, and if your bike shares your living space no need to worry about oily marks or dirty looks from those you share your life with. Before riding the Peacemaker I had those down as fairly minor pluses but they turned out to be far more satisfying than I'd expected… especially the trouser leg bit. So that's the ride, as I've already said the frame is a lovely piece of work, personally I'm not a fan of white bikes, black is much more slimming and all, but I'll make an exception for the Peacemaker's pearlescent Ice White Shut paint job. I particularly like the matching pearlescent finish on the saddle – which I found comfortable. The whole thing is put together with Fixie's usual attention to detail, although there was some debate between myself and TR as to whether the finish on the welds was quite as good as you'd expect on a bike at this price… well, it's of a high standard but it's not totally perfect and that belt does cost a lot of money and TR is well picky. On detail sets the frame apart from something similar made for a chain drive bike is Fixie's JigSaw frame coupler a fiendishly simple solution to the problem of the splitting the frame to get the belt out in the unlikely event you'd need to. Essentially it's a male/female union positioned mid-way up the drive-side seat stay, the guys at Fixie placed it here because they feel that splitting the frame at the dropout introduces the potential for unwanted flex. Other details of note are that to accommodate the belt the spacing between the rear dropouts is 135mm (the same as a mountain bike) rather than the standard 120mm you'd get on a track bike. We also liked the JetKit brake pin set - should you want to remove either the front or back brakes Fixie supply a neat 'pin' that mimics the Carscratcher handlebar ends to fit in the brake bridge. Interestingly though the bike comes with brazed on cable guides for the back brake so the bike won't have a totally clean line should you whip it off… much to TR's chagrin - me, I like brakes. The cloth-capped one and I both agreed though that the only thing we'd change would be the handlbars, he wanted a wider one-piece bar and stem, I'd just be happy with something a tad wider. Oh, and I'd probably ditch the grips too – just too grippy. So all great then? Nearly. The one doubt we'd have is the belt not its day to day running or even long term durability - once you've got it set up you should have no problem. It's the getting it set up that could cause a problem, or more likely adjustment in the the field. While the belt doesn't need to be mega-tensioned (more on that later) it does have to be straight and we mean really straight – if not, as I found out, the belt will pull itself off the bike, not something you want to happen if you are riding up a sharp hill at the time. That belt popping incident was the result of a tiny mis-alignment in the set up and came at the end of a day of riding it. We don't think this will be a problem for buyers, their bikes and belts will be set up by more experienced mechanics than ours, and get it up on a workstand and getting the belt straight is relatively easy – careful though! You don't over-tighten those limit screws… That way disaster lies, the very last thing we did to our bike was snap a limit screw with a bit of last minute “fettling”. Sorry Fixie. We reckon that most people won't need to get their bike up on a stand to adjust the belt or switch from fixed to free (easy to go to free, rather harder to get back to fixed without a belt whip of some sort), however bikes do get punctures and getting things adjusted properly in the dark by the side of the road could cause you problems – you'll have to slacken off those limit screws to get the wheel out. On the plus side you won't get oily hands sticking the belt back on, and by eye you should get the belt straight enough to get you home - you might need to give it a final tweak when you get there. No doubt with practice you'd be able to sort it out, but ideally some sort of indicator on the limit screws would be good, as would some way of showing that you had the belt tensioned properly – maybe an indicator on the dropout the the axle aligned to with indicators on the limit screw to help you fine tune things. Coincidentally we've just got the very much more expensive Trek District Madone belt drive in on test, which shows an interesting contrast in approach. Of course the District Madone can't be switched from fixed to free as easily as the Peacemaker, but when it comes to the question of getting the wheel in and out and the belt properly tensioned and aligned Trek have gone for a solution that is more complex from an engineering point of view, but which looks to be simpler for the end user – an eccentric dropout and hub arrangement. Fixie on the other hand have gone for a simple and elegant engineering solution but one which is probably more complicated for the end user – at least to begin with. If you were in the market for a Peacemaker we wouldn't let our belt niggles put you off, equally though it's best to be aware that the belt at the heart of the bike is a fairly close tolerance piece of kit. Because let's be honest if you are going to buy this bike it's going to be all about the belt… probably not the low maintenance aspect, because if you're spending this amount of money it's unlikely you'd neglect to look after it anyway. You're not going to be buying it for its low weight either, because you could build or buy plenty of more conventionally driven singlespeeds that would weigh less for the same or less money. No, the only practical reason to buy the Peacemaker is that it won't get oil on your trousers and the compelling impractical ones are that it's different and it's so damn cool. Which are pretty good reasons. Curse you Fixie Inc this is a hard bike to come to a simple verdict on. On one level it is very expensive for a steel singlespeed. But this is no bog standard steel singlespeed - that belt is expensive and the bike and without it the 2009 Peacemaker was only £100 less. Plus it is a very nice bike to ride and you could pay a lot for a "look at me" steel fixer and get something nowhere near as good. If you are in the market for something different this is a bike whose "difference" is much more than skin deep. 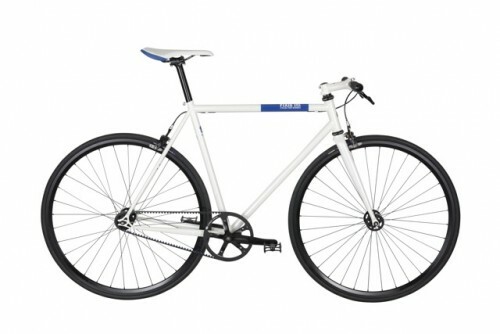 Here's TR's take: "I don't think the sort of person who spends 1200 quid on a belt driven single speed has bought it because it requires less maintenance or because it is too nice looking to neglect (and too expensive) and I don't think it is a weight issue - you could build up a titanium/carbon bike for this which will be lighter and I don't think that the completely silent transmission is a buying factor. That leaves the oily leg. It must be that, oh and the fact it looks really cool." Mine would be "fans of the new, and the different"
Hard to give a mark for value, because that belt costs so much and for a belt drive bike from an outfit like Fixie the price is pretty good value. Judged as a steel singlespeed it isn't. Mind you, it's less than the Colnago Super Singlespeed and is a considerably better bike than that. Certainly interesting but I prefer the original incarnation complete with drops and chrome fork.